Trained her to understand and use social media tools. Helped her identify and strengthen her voice online. Served as a self-discovery catalyst to assist her in exploring and expressing her passions and interests. Assisted her in cultivating her own network of social media colleagues. Exposed her to local and online social media events. Helped her develop and implement long-term strategies to support her life reinvention efforts with social media. Completed home study training and homework assignments. Practiced using Twitter, Facebook, and other social media tools on a weekly basis. Used Cinchcast to create weekly audio blog posts and build her audience. Developed and hosted her own monthly radio show on Digital Sisterhood Radio via Talkshoe.com. Participated in the Digital Sisterhood Network’s Tweetchats on Twitter and various online events. 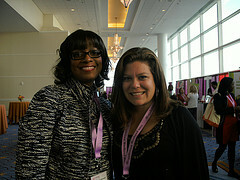 Attended social media events including the Blogalicious DC Meet Ups and Weekend Conference. Participated in a panel discussion on Digital Sisterhood Radio during Digital Sisterhood Month. Kamaria T. Richmond, a native Washingtonian and writer, is passionate about spirituality, fabulous and healthy living, family and friends, lifelong learning, fashion, beauty, hair, the arts, music, and so much more. She began sharing her insights about her health journey and lessons learned as the Present Moment Living Correspondent for BAP Living Radio on Talkshoe.com in 2009. Prior to working with BAP Living Radio, she worked at WPFW 89.3 and WGMS 103.5 radio stations in Washington, DC. She earned a Bachelor of Arts in Radio, Television, and Film with a minor in Afro-American Studies from the University of Maryland. She completed coursework in a Master’s degree program at University of Maryland’s University College. She is a member of Sigma Gamma Rho Sorority, Inc. Her first episode of The Stroke Diva Fabulous Show aired on March 13, 2011 on Digital Sisterhood Radio. Richmond created The Stroke Diva Fabulous Show to celebrate life after her 2004 stroke and discuss her passion for spirituality, healthy living, lifestyle reinvention, the arts, music, current issues, popular culture, fashion, beauty, hair, travel, gourmet food, wine, home decor, and so much more. 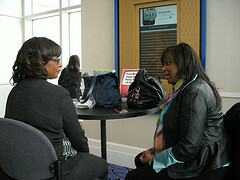 In 2012, Ms. Richmond will continue to host and produce The Stroke Diva Fabulous Show on Talkshoe.com. Click here to learn more about her upcoming shows and guests. She will also continue to use Cinchcast, Facebook, LinkedIn, Twitter, and Flickr to share her lifestyle audio blogs and adventures in social media. In addition, she is working on an eBook about the power of social media in her life.